Between red hot first quarter prices and major policy bombshells like Ontario’s Fair Housing Plan, 2017 was one to remember for the Canadian housing market. It can be hard to keep track of everything that went down in the past year. To jog your memory, BuzzBuzzNews has rounded up five charts that make sense of 2017’s major real estate events. 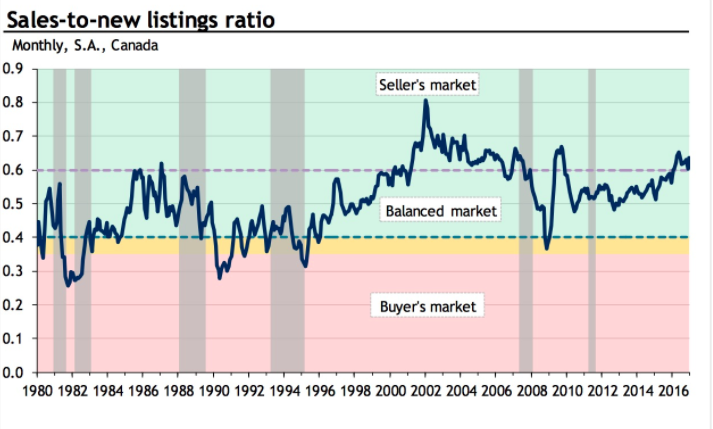 What’s going on here: A sales-to-new listings ratio determines how balanced a housing market is. A ratio between 40 and 60 is considered balanced, while anything below or above is a buyers or sellers market, respectively. The takeaway: In February, the ratio was spiking to about 0.63 per cent, the highest level since the Great Recession. 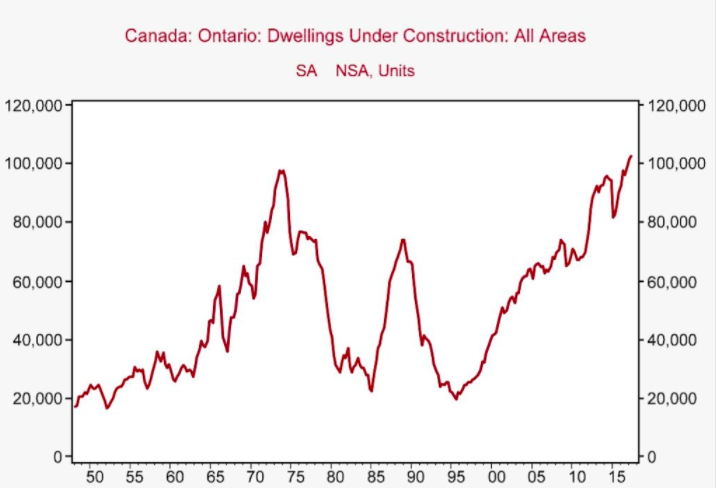 What’s going on here: This chart tracks the number of homes under construction in Ontario since the 1950s. The takeaway: In the second quarter of 2017, driven by huge demand in the GTA, contractors were building more homes than anytime since the 1970s. 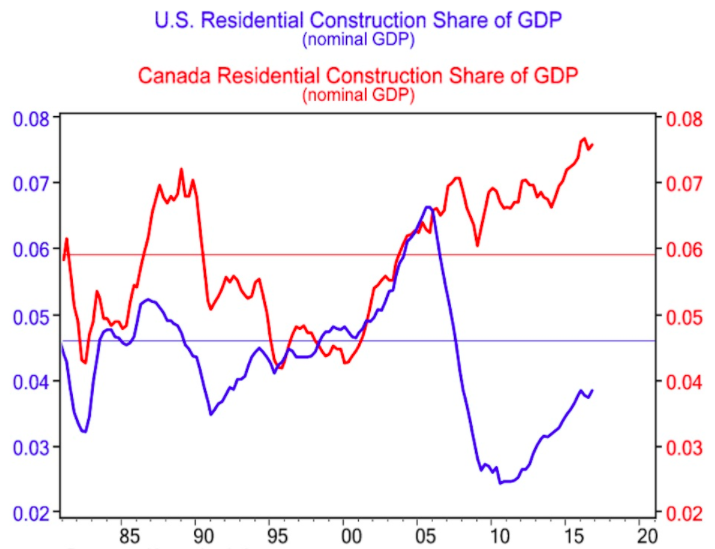 What’s going on here: BMO Economics compares housing as a share of the Canadian and US GDPs since the 1980s. The takeaway: While the US is still recovering from 2008’s crash, Canada’s prices keep climbing, contributing a huge amount to the country’s economy in the first half of 2017. 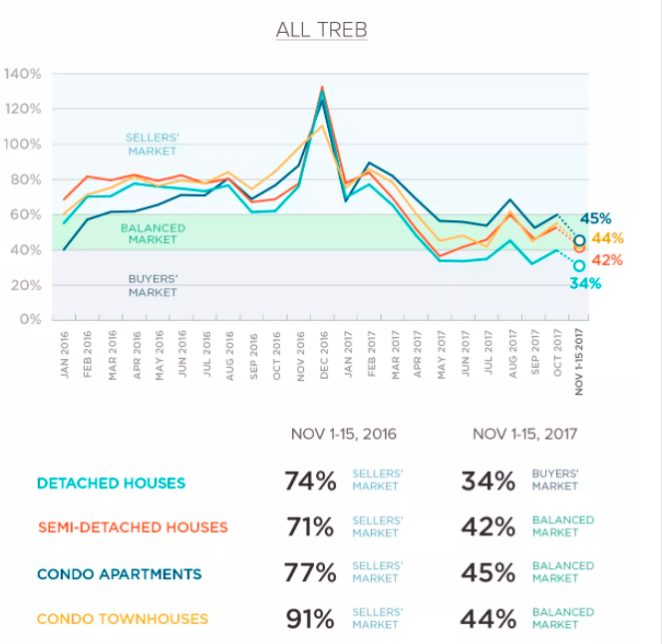 What’s going on here: Real-estate website Zoocasa tracked the sales-to-new listings ratio of different housing types in the GTA over the last year. The takeaway: After spiking into an extreme sellers market in the first quarter of 2017, Ontario’s Fair Housing Plan caused the market to balance out in the fall. 5. But who knows what could happen in 2018? 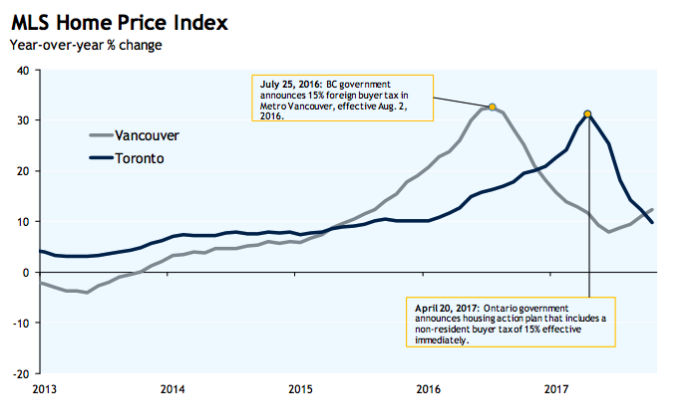 What’s going on here: The RBC Economics team tracked the MLS home price index for Vancouver and Toronto since 2013. The takeaway: The BC government implemented a foreign buyer tax for Metro Vancouver in August 2016, which cooled prices for awhile, but couldn’t keep them down for long — they’re now back at pre-tax levels. While Ontario’s Fair Housing Plan dampened the GTA market when it was announced in April, it’s possible Toronto could see prices rise again in 2018.